X-Men #1 , published by Marvel Comics, featured the first appearance of the mutan X-Men, a team of young mutants led by Professor Charles Xavier (Professor X). This issue introduced Professor X, Cyclops, Beast, Iceman, Angel, and Marvel Girl. X-Men #1 also introduced Magneto as the villian. The series was not very popular at first, and was actually discontinued after X-Men #66. Marvel did continue the series run with reprinted stories in issues #67-93. 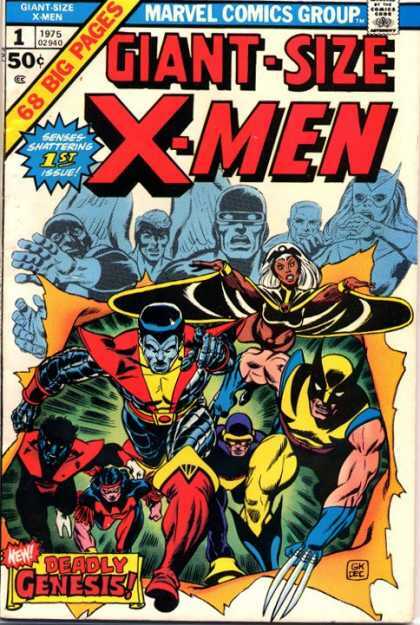 In 1975, the series was revived with the publication of Giant-Size X-Men #1, which introduced a new team of X-Men made up of Cyclops, Wolverine, Storm, Colossus , Nightcrawler, Thunderbird, Banshee, and Sunfire. Many of the new members came from other nations (Wolverine from Canada, Nightcrawler from Germany, and so on), and this gave the X-Men a very multi-national flavor. Giant-Size X-Men #1 acted as bridge between the original X-Men and a new, more internationally-flavored mutant team. Chronologically this important issue is placed before The Uncanny X-Men #94 in the comic book series. Giant-Size X-Men #1 is a 68-page issue published with a May 1975 cover date but distributed to newsstands in February of 1975. Following the introduction of the new X-Men team, sales of the series increased. In fact, Wolverine soon became a very popular Marvel character, eventually earning his own series in 1988. From issue # 1 through issue #49, the series was titled "The X-Men," and was called "The X-Men" from issue # 50 through # 113. Beginning with issue # 114 through # 393, the series was titled "The Uncanny X-Men," and from issue # 394 to today, simply called "Uncanny X-Men." Regardless of the exact title, the X-Men/Uncanny X-Men is Marvel's longest running series to maintain the original numbering from the first issue to the present day. In June, 2011, Marvel announced that as of issue #544 (to be released in February of 2012), the Uncany X-Men series will end due to a plotline called "Schism," in which the team is split up. This will apparantly end this comic book series' numbering continuity.